LOS ANGELES: Trial Begins For Man Charged In Torture Death Of Boy He Thought He Was Gay [VIDEO] - Joe.My.God. 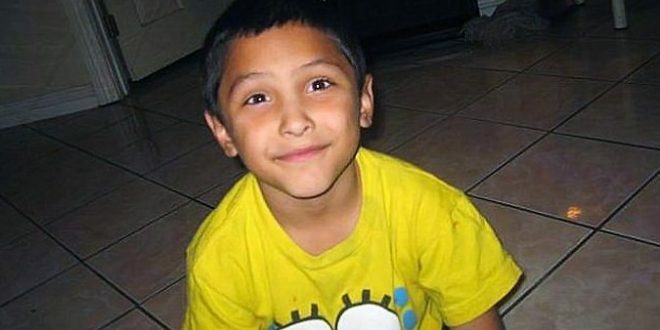 A man accused of torturing his girlfriend’s 8-year-old son to death killed the child because he thought the boy was gay, a Los Angeles County District Attorney’s Office prosecutor said during opening statements Monday. Aguirre, 32, is charged with murder with a special circumstance of torture. Prosecutor Jon Hatami detailed the acts allegedly committed by Aguirre and the boy’s mother, Pearl Fernandez, who also faces trial. Hatami explained that the Palmdale couple beat Gabriel, bit him, burned him with cigarettes, whipped him, shot him with a B.B. gun, starved him, fed him cat litter, and kept him gagged and bound in a small cubby until he was found on May 22, 2013. The couple called first responders to treat Gabriel, but that was only in an attempt to mislead, the prosecutor said. The prosecutor said that Aguirre made Gabriel dress up in girls’ clothes and go to school. He added that Aguirre just didn’t like Gabriel and thought the boy was gay, and that was his motivation for his treatment of the child. The defense concedes that Aguirre murdered Gabriel, but claims the final beating came because the child told his mother to leave her boyfriend. The mother will be tried separately.